Couch Potato is a modern term that people use to describe a lazy person who does not leave his couch. This is why players will see the logo of the game and on top of it, they will see a big potato residing on the couch with a lazy face refusing to get off. So get your laptop, sit on your couch and be a couch potato, but instead of wasting your time and watching TV or playing games, place bets on this slot so you can grab one of its many rewarding payouts that it has in store for its players. 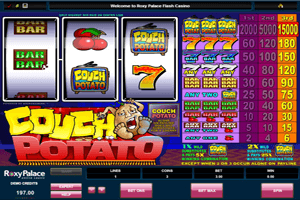 Play Couch Potato Slot here. Couch Potato is a three reeled classic slot machine that offers players one single payline that they can place their bets on. On this payline, they will have to form a combo that consists of three matching symbols so they can be eligible to claim a reward. The biggest payout that Couch Potato has for players is equal an amazing 15000 coins. They can get to claim this payout when they get three couch Potato logos on the payline of the game after they have placed the biggest bet of 3 coins. If they place 1 or 2 coins, they will claim 2000 and 5000 coins respectively. The Couch Potato logo is wild which gives it the ability to replace other icons on the payline while multiplying the rewards by 5x or 25x when 1 or 2 of them land on the payline at the same time.